As we age, our skin naturally starts to change. You may notice that, as the years go by, wrinkles and frown lines can form on your face and your skin may start to sag. However, this doesn’t mean that you can never have youthful and supple-looking skin ever again. 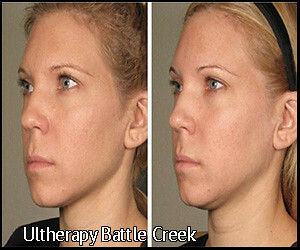 This is where Ultherapy® in Battle Creek can be beneficial. Through Ultherapy®, Battle Creek individuals can reverse some of the visible signs of aging without going under the knife. A noninvasive cosmetic procedure, Ultherapy® in Battle Creek can lift and tighten the skin, allowing you to get rid of unwanted wrinkles and lines. If you’re interested in trying Ultherapy® in Battle Creek, reach out to the team of professionals at Restorative Health Care. What Is Ultherapy® in Battle Creek? Ultherapy® is a safe, nonsurgical cosmetic treatment that uses focused ultrasound to generate new collagen deep within the skin. The main goal of Ultherapy® in Battle Creek is to counteract the effects of time and gravity on the skin, lifting and tightening it over time. Since the treatment is noninvasive, there is no downtime afterward. Using the body’s natural regenerative response, Ultherapy® in Battle Creek can gently and gradually lift skin on the eyebrow as well as under the chin and neck. For individuals who want to smoothen wrinkles and fine lines on their faces, Ultherapy® in Battle Creek can also be useful. How Does Ultherapy® in Battle Creek Differ From Laser Treatments? Laser treatments and Ultherapy® in Battle Creek are similar in the sense that they both treat different types of skin issues. They differ on the type of energy they use and which skin layers they are able to reach. Laser treatment relies on light energy, while Ultherapy® in Battle Creek uses sound energy. Ultherapy® uses ultrasound technology to stimulate collagen production in the skin’s foundation. Unlike laser treatments which cannot reach deeper skin layers at an optimal temperature, Ultherapy® in Battle Creek can bypass the surface of the skin to treat depths not matched by other cosmetic devices. Who Is a Good Candidate for Ultherapy® in Battle Creek? Before you set your mind on undergoing Ultherapy® in Battle Creek, make sure to consult with a practitioner to see whether the procedure will work well for you. Good candidates for Ultherapy® in Battle Creek have mild to moderate skin laxity where the skin begins to feel and look less firm. So, if you have lowered eyebrow lines, sagging skin under your chin, lines and wrinkles on your chest, or loose skin on the neck, Ultherapy® in Battle Creek may be beneficial for you. How Long Does One Session of Ultherapy® in Battle Creek Take? When undergoing Ultherapy® in Battle Creek, the length of one treatment will depend on the area being treated as well as your individual treatment plan. One session of Ultherapy® in Battle Creek for the face and neck typically takes 60 to 90 minutes, while a procedure for the chest may only take 30 minutes. After months, as your body naturally regenerates collagen, you’ll start noticing the results. What Does the Treatment for Ultherapy® in Battle Creek Feel Like? For effective noninvasive and minimally invasive cosmetic procedures, depend on Restorative Health Care. Consult with our team, and find out whether Ultherapy® in Battle Creek is the right procedure for you! Click here to learn more about our Ultherapy treatment.